The Night of Power, also known as the night of Decree and in Arabic known famously as ‘Laylatul Qadar’, is a significant night during the month of Ramadan for Muslims all over the world. For it was on this blessed night that the Qur’an was revealed over 1400 years ago, as a guiding light and mercy. As this verse teaches us, the Night of Power is a night that is better and higher in rank than 1,000 months. When calculated into years, this adds up to over 83 years! Most people do not even live past the age of 83 and yet God Almighty has gifted mankind with a single night of innumerable blessings, a night worth more than a lifetime! Can you even imagine that? Glory be to God, the Most Gracious, the Most Merciful! It is the only night in which Angel Gabriel along with all the other angels descends from the Heavens to the Earth. A night abundant with blessings and mercy showered down upon Muslims by God, as each of them turn sincerely to Him, seeking His Forgiveness and Guidance, as the pages of their books and records are opened and their destinies are decreed for the coming year. Meaning the matters of deaths, births, provisions, calamities, for the whole (coming) year as decreed by God. 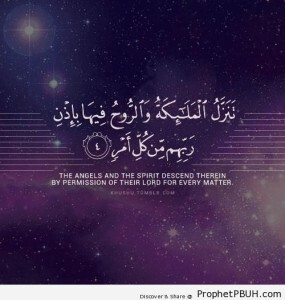 This night, according to the Prophet Muhammad, is to be found and searched for during the last ten nights of Ramadan and will fall most likely on an odd night. Thus, during these last ten nights, Muslims from all over the world, in groups and in solitude, in public and in private, in every language known to exist, and every ticking minute of the hour, strive to worship God ardently and sincerely, seeking entrance into His Paradise, and protection from His Hellfire. It is these nights in which the essence of Tawhid – oneness of God Almighty alone – is revived and rekindled in the hearts of Muslims, as the realization that their fate and result in the Hereafter ultimately and completely lies with their Lord. Night long prayers are established, and fervent supplications are asked, every tongue wet with the remembrance of Allah, every heart yearning to seek His pleasure. Hands are raised, eyes are overflowing with tears, knees are bent, and foreheads are prostrated out of sheer humility, in complete submission to the Creator. It is a night on which Muslims are reminded of the simple fact that they are slaves, that their Creator is the Almighty and All-Powerful, that this world is perishable, that the Hereafter is everlasting, and that every beat of their heart is bringing them closer to their final End. So, dear brothers and sisters, look out and search for the night of Decree and increase your worship on this night; a night on which peace will descend on the world, your every supplication will be answered, and your sins will be forgiven. We ask God Almighty to allow us to reach the night of Decree, to grant us the amazing opportunity of drawing closer to Him on this great night, and to accept and bless all our worship to Him on this night and all others. Boost your worship to a higher level and spend the entire night in worship. Aim to excel! These are the BEST nights! Plan your worship beforehand so you do not waste any precious time on those nights. Planning hourly is one of the best techniques. Make heartfelt supplications to God Almighty and open up your heart to Him. Du’aa is the essence of all worship. And indeed God Almighty is the hearer of supplications. Connect to the Qur’an during these nights and read it with understanding and meaning. Let it be your shining light in life. May Allah be with you and help you and all of us to always increase our iman and taqwa ameen.